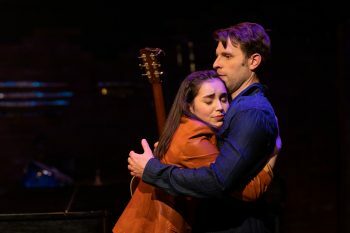 Due to overwhelming demand, SpeakEasy Stage Company has added seven more performances of its acclaimed production of the Tony Award-winning musical ONCE. The show will now play through Sunday, April 7, 2019. The entire original cast will remain for the additional week of performances. The new block of seats for these additional performances will go on sale this Friday, March 8, 2019 at noon. SpeakEasy General Manager Paul Melone directed this production of ONCE. Winner of two Elliot Norton Awards for his direction of the musicals Bloody Bloody Andrew Jackson (2013) and Adding Machine: A Musical (2010), Mr. Melone also directed the company’s Boston premieres of Carrie: The Musical; reasons to be pretty; The Little Dog Laughed; Fat Pig; The Moonlight Room; Our Lady of 121st Street; and The Shape of Things. Nile Scott Hawver and Mackenzie Lesser-Roy play the lead roles of Guy and Girl. Jacob Brandt, Billy Butler, Clara Cochran, Chris Coffey, Reagan Gardiner, Billy Meleady, Robert X. Newman, Marta Rymer, Stephen Shore, Jeff Song, Kathy St. George, and Ellie van Amerongen make-up the ensemble of actor-musicians. The design team is Eric Levenson (scenic); Rachel Padula-Shufelt (costumes); Karen Perlow (lighting); and Andrew Duncan Will (sound). ONCE will now run through Sunday, April 7, 2019, in the Roberts Studio Theatre in the Stanford Calderwood Pavilion at the Boston Center for the Arts, 527 Tremont St. in Boston’s South End.